Posted February 6, 2018 by The Rapid & filed under Places to Go. Love is in the air! Do you have plans for Valentine’s Day yet? Valentine’s Day is the perfect opportunity to celebrate with your special someone. As always, we’re dishing out destinations and tips for a romantic, transit-friendly rendezvous. Let us do the driving so you can spend time paying attention to your sweetheart instead of the road. Date Night Extraordinaire at Country Inn & Suites East Beltline. Bundle up and take your Valentine’s Day excursion outside with one of the many World of Winter Festival events! 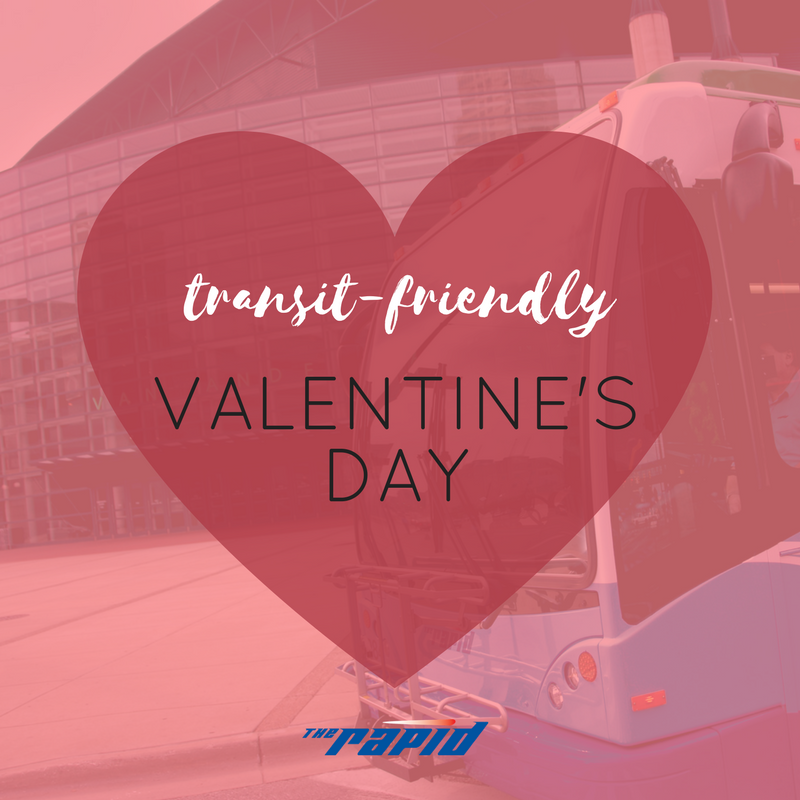 Ride The Rapid to Downtown Grand Rapids for a romantic ice skating date at Rosa Parks Circle. On Valentine’s Day, February 14th, ice skating will be buy-one-get-one-free. Even better, you and your special someone can get a free professional photo taken in front of the community sculpture! View all of the World of Winter Festival events here. If you’re looking for a bit more rustic, transit-friendly destination, don’t miss a chance to snowshoe with your sweetie at Blandford Nature Center! This event features an easy, candlelit hike for all experience levels. Enjoy a glass of wine from a local winery around a fire after! If you’re planning on a special dining out, make sure you get your reservations in as soon as possible. There are so many wonderful restaurants in and around Grand Rapids If you’re looking for a special menu for you and your sweetheart, consider visiting six.one.six at the JW Marriott Hotel is featuring Valentine’s Day Dinner for two with delicious options. Another great option is the Valentine’s Week Celebration at The B.O.B.! There will be a specially crafted dinner for two in any of the amazing B.O.B. restaurants! Plan your trip now by visiting ridetherapid.org!